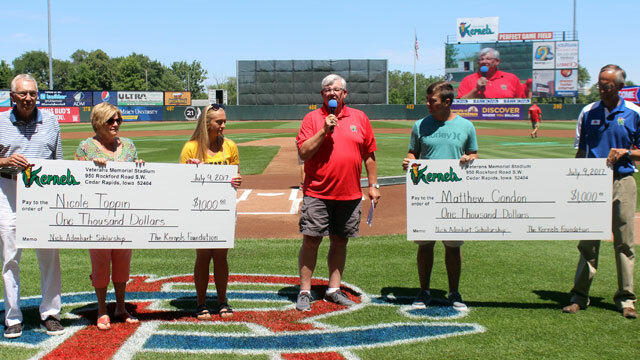 Cedar Rapids, IA - The Cedar Rapids Kernels and Kernels Foundation are pleased to announce Nicole Toppin and Matt Condon as the winners of the 2017 Nick Adenhart Memorial Scholarships. They were recognized in an on-field ceremony before the Kernels game with Peoria on Sunday, July 9th. Nicole Toppin is a member of the Class of 2017 at Marion High School and plans on attending the University of Iowa and majoring in Business and Spanish. Matt Condon is a member of the Class of 2017 at Linn-Mar High School and plans on attending the University of Iowa and majoring in Business and Sports Management. Nick's family continues to honor him with the awarding of two $1,000 scholarships in his memory. The Kernels Foundation is privileged to administer the scholarships on behalf of Nick's family. The Kernels wrap up a seven-game home stand against the Peoria Chiefs on Monday, July 10th at 12:05 PM with the gates opening at 11 AM. Chris Kleinhans-Schulz and Morgan Hawk bring you all of the play-by-play on the radio home of Kernels baseball, 1450 KMRY AM and 93.1 KMRY FM. Fans may listen on-line at www.kmryradio.com, or www.kernels.com. Fans may also stream all 70 Kernels home game and selected road games via a MiLB.TV subscription. Visit MiLB.TV for subscription information.